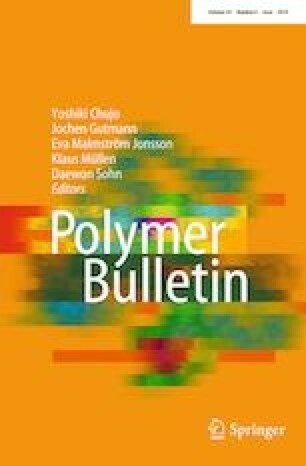 Smart hydrogels comprising guar gum (GG) and poly(N-isopropylacrylamide) (PNIPAAm) cross-linked using a non-toxic cross-linker, tetraethyl orthosilicate, have been designed to explore the sustained release of an anticancer drug, 5-fluorouracil (5FU). Hydrogels containing preformed solid inclusion complexes (IC) of 5FU in β-cyclodextrin (β-CD) were designed to regulate the drug delivery. The formation of true 5FU/β-CD ICs was affirmed from different spectroscopic techniques. The DSC studies of the hydrogels revealed that the thermosensitivity of PNIPAAm is retained in the resultant hydrogels, also corroborated from the swelling measurements. The rate of 5FU release from the hydrogels containing the IC was significantly prolonged in comparison with those containing the free drug. Higher amounts of GG in the matrix led to slower release of drug. The preliminary kinetics of drug release indicated the collective influence of β-CD and GG content on the polymer relaxation process which was key in sustaining the drug delivery. Release studies in simulated gastric (SGF) and intestinal (SIF) fluids showed less than 10% of 5FU release during the initial 2 h in SGF and an increased release in SIF. Thus, the developed smart hydrogels can be utilized as potential candidates for sustained oral delivery of 5FU to the intestine. The online version of this article ( https://doi.org/10.1007/s00289-018-2526-4) contains supplementary material, which is available to authorized users. The authors thank the Department of Science and Technology, India, through the DST Fast Track Young Scientist Scheme (SR/FT/CS-76/2010) for the financial assistance.